If you are a homeowner, it is important you take the time to secure your house. Even if you live in a safe neighborhood, you must take the time to protect your home. Home security is not only about keeping your house safe, but it also keeps the neighborhood safe. Burglars are less likely to commit crimes in a neighborhood if all the houses are secure. If even a small number of homes lack security, it may put the other homes at risk. Some homeowners are dissuaded from improving home security because they overestimate how expensive or difficult it can be to install. While there are expensive home security options, these are not required to protect your home. In fact, buying an expensive or complex security system is often viewed as a mistake by home security experts. If you buy something too complex to install, it does nothing to protect your home. Security only works if you and everyone else in your household understand how to use the system. Home security cameras have been a staple in home security for years. 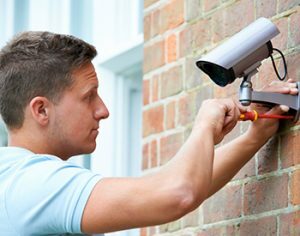 In the past, home security cameras were seen as one of the most expensive ways to protect your home and were primarily only viable for businesses. However, home security systems have undergone many changes, and thanks to significant upgrades in technology, there are many variants of security cameras available for purchase. Some models are still expensive and hard to install, but there are plenty designed specifically for affordable home security. One of the biggest differences in home security systems comes from wireless or battery powered models. Previous models always had to be hardwired into your home and monitored from a set station. These models were harder to use and ultimately provided limited protection. Newer models can be placed anywhere inside or outside your home. These models are small enough that you can reliably hide them from view. Some outdoor models are solar powered. These models work well if you have an upcoming long vacation and do not want to worry about your battery-powered cameras dying. Another benefit of new home security cameras is accessibility. Many cameras use a smart system, which allows you to sync the camera feed with your computer, smartphone or tablet. As long as you have an active internet connection, you can access your feed. Some common places for home security cameras include above the front door, windows or garages. The price for these camera systems vary, but you can find reliable cameras for reasonable prices. Even advanced camera systems are not overly expensive if you want additional security. Many home burglaries involve the front or back door. A common misconception regarding burglaries has to do with the term “break in.” Burglars go after homes where they can enter without physically breaking anything. Entering a home by force, such as by breaking a window, is loud and draws obvious attention to the burglar. However, entering through the front or back door does not make noise and looks like someone is visiting the house rather than breaking in. Changing your locks is one of the easiest and most affordable ways to protect your door. Deadlocks do not feature a key on the outside, meaning the only way to get through the door is by force. Deadlocks are built to withstand impact, so it would take repeated attempts to break. Quietly breaking through a deadlock is almost impossible. Another easy change to make is adding security door hinges. Clever burglars disable outdoor hinges, allowing them access to the house without making any noise. You can install set screws and studs to keep burglars from easily popping off the pins securing your door hinges. There are two smaller changes you can make to add an additional layer of protection to your doors. The first is installing motion lights around the front of your door. Motion lights frequently startle burglars, since the lights naturally draw attention to the doorway. The other security option for doors is to install a peephole or small view window into the door. This security method only works when you are at home, but it allows you to view who is outside before you open the door, protecting you from inadvertently letting in any burglars. While the majority of burglaries involve the front or back door, there are some bolder criminals who break through windows to get into a home. If your house is in a secluded neighborhood, it is easier for criminals to break in through the windows, especially during the evening where there is less traffic around your home. One option to protect your window is to install metal window bars or grilles. These are inexpensive and easy to install, but many homeowners do not like the appearance. Some companies produce smaller, more decorative window bars. These window bars can be customized to match your windows. If you do not want to add any type of window bars or grating, you can reinforce the window glass. One of the ways to protect your glass is with security film. Security film hardens glass and makes it much harder to break through. You can get tinted security film if you do not want burglars to be able to see into your house. Installing security roller shutters or laminates is another security option. Roller shutters and laminates are not as effective as security film, but both methods are less expensive than buying security film. Flip locks are the easiest to install and typically the least expensive option. The downside is these locks are physically easy to break. Keyed locks are stronger than flip locks but are not compatible with all window types. Sash locks allow you to secure single- and double-hung locks, as well as casement windows. Sash locks are typically the most common window lock used in home security.